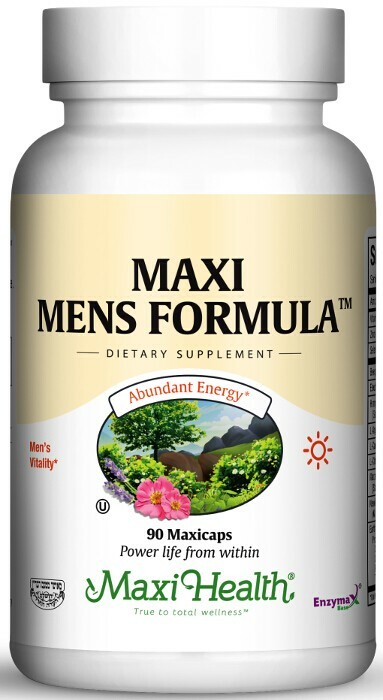 Maxi Men's Formula™ includes a variety of vitamins, herbs, and amino acids to create a great product. It’s got Vitamin E, Zinc, Selenium, Eleuthero powder, Horny goat weed extract, L-Arginine, MacaPure® Maca extract, L-Citrulline Bee pollen powder, L-Carnipure® L-Carnitine, PureGar® Odor controlled garlic, Earthrise® Spirulina. It’s everything you would expect from your health partner at Maxi Health Research! Try Maxi Men’s Formula today!. Take four (4) Maxicaps™ daily with meals, or as directed. Other Ingredients: Vegetable cellulose, rice flour, vegetable magnesium stearate, maltodextrin, tricalcium phosphate, Enzymax® (calcium carbonate, bromelain, papain, lipase, amylase, protease, silica) and chlorophyll. This product contains no animal products, wheat, soy, gluten, yeast, salt, milk, artificial flavors, colorings or preservatives. MacaPure® is a registered trademark of Naturex, Inc. • NewGar® is a registered trademark of Nature Science. • TRAACS® is a registered trademark of Albion Laboratories, Inc.